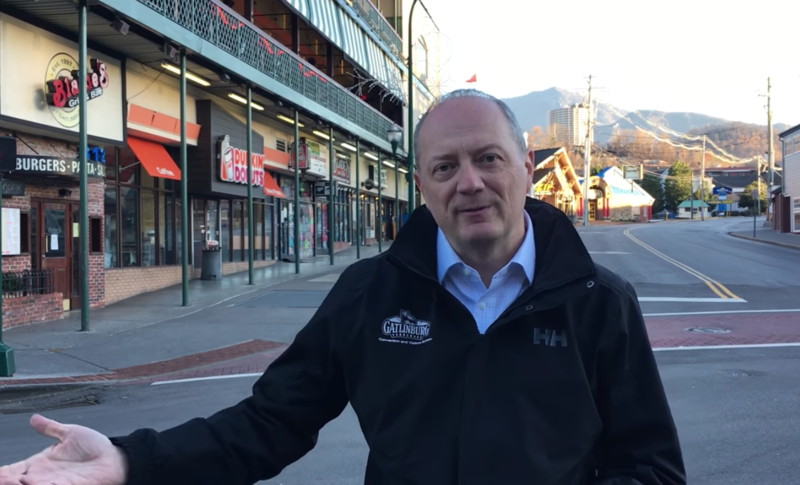 Gatlinburg's tourism chief, Mark Adams, shows off downtown Gatlinburg in a video released Dec. 2. The city's mayor put out a similar promotional video this week. At a press conference less than 48 hours after the evacuation, Gatlinburg mayor Mike Werner stepped up to the podium, and his home and business both burned down in the fire. He was still wearing the same plaid shirt from the day before. First he said the town was going to be OK. Then, he turned to business. 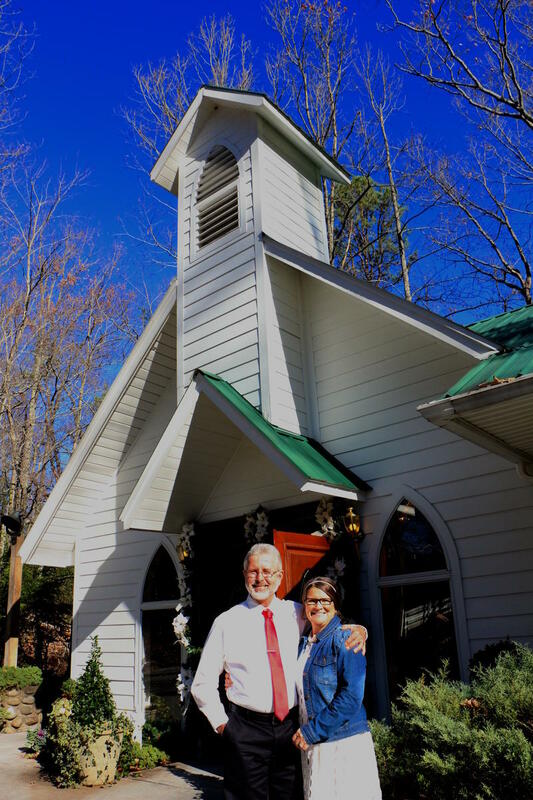 "If you really, really want to do something for Gatlinburg, come and visit us," he said. "Come back and vacation here. Come back and stay in our hotels and our condos and our chalets, and eat in our restaurants, and enjoy our attractions." Gatlinburg is a city of just 4,000 full-time residents, but it has about 12 million visitors each year. Officials say the industry accounts for nearly three-quarters of the city's jobs and brought in $620 million in tax revenue last year. If the fire keeps tourists away, that's a particular concern at this time of year. December — when everything is decorated for the holidays — is usually the last busy month before a slow period. Just down the road in Gatlinburg's larger sister city, Pigeon Forge, the Inn at Christmas Place is Yuletide-themed all year long — although this, of course, is usually a peak season, says marketing chief Janet Donaldson. Even though most of Pigeon Forge escaped the fire, Donaldson had to reassure people it was OK to come. "Somebody wrote today and asked if we had much smoke damage, and I was able to explain that we are very fortunate to be safely away from the fire area," she says. Gatlinburg, however, took a bigger hit. The whole downtown has been closed since last Monday. 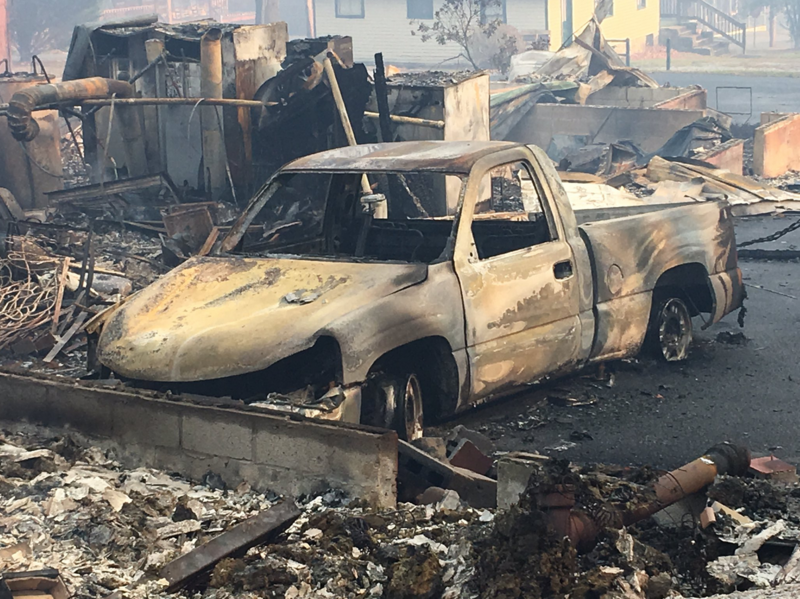 Several businesses burned, along with rental cabins scattered throughout the mountain town. That means not only loss of tourism but also loss of tourism jobs. "More than likely because of all the damage, a lot of people won't be spending money like they were," says Rufus Surles, who spent several nights in a shelter after being evacuated. "They won't be coming to vacation. It's going to cost us a lot of business and probably cost some of us our jobs." Surles moved to Gatlinburg from Florida earlier this year to work at a restaurant. He lives in an apartment in the same building. It didn't burn, he says, but he knows his job will be cut. Still, Gatlinburg officials are trying hard to overcome the images of rubble and roaring flames to entice visitors to come. This week, the mayor put out a video showing off the city's main commercial strip, which is largely intact. He thanked people for donations and prayers — but the best way to help, he said, is to plan a trip. That's the message from officials in Gatlinburg, even as they're still working to put out the fires that have ravaged the city. The invitation shows just how vital tourism is to the area. Update: 12/5/16 at 7:45 a.m.
On Sunday, another death was attributed to the fire, bringing the death toll to 14. 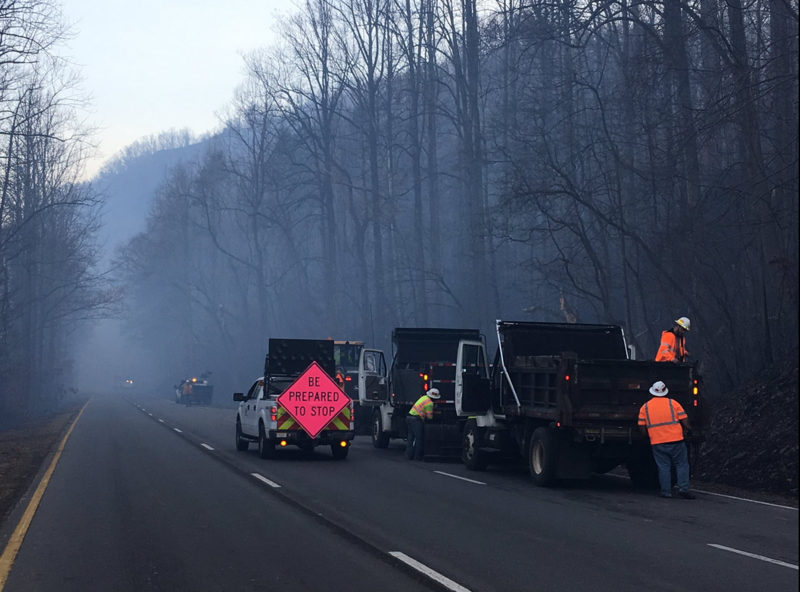 Smoky Mountain National Park officials say 81-year-old Elaine Brown was fleeing the fire when she suffered a "medical event" that led to a motor vehicle accident. Three people have been found alive in an elevator after surviving Monday night's firestorm in Gatlinburg. Their rescue has been a bright spot amid reports that at least seven people were killed and hundreds of structures burned.